Do you adhere to any local or national whale-watching guidelines or regulations? It is unlikely that any operator will answer “no” –but asking the question shows that you are aware that they should be following guidelines, and that as a client you view this as important. You may want to do some homework in advance and consult the guidelines and regulations section of this site to learn about the regulations that are in place in your whale watching destination. Where local or national guidelines or regulations exist, operators should display them visibly in their office and/or on their vessels. Where there are no formal regulations in place, the following questions become even more important for you to ask. How do you ensure that your tours/boats are causing minimal disturbance to the animals? A good operator should be able to give you some specific examples of measures they take to avoid disturbance – such as respecting approach distances, not approaching groups of whales that are already surrounded by other boats, limiting the amount of time they spend with an individual whale or group of dolphins, taking extra care around mothers and calves, etc. 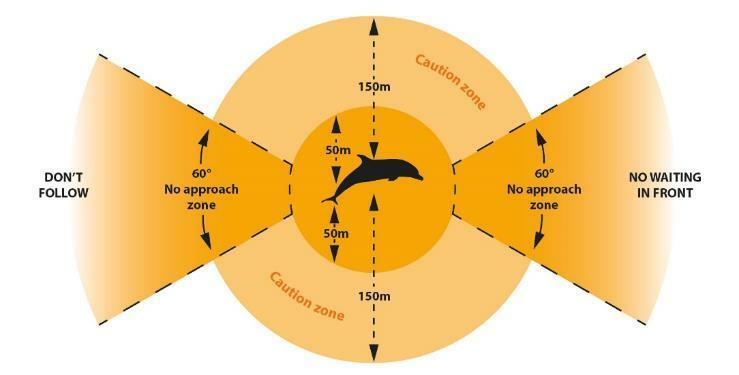 Remember, that research has shown that vessels respecting approach distances and allowing the whales or dolphins to choose how they will interact with the boat generally enjoy more rewarding and longer encounters with the animals than those that approach too quickly, chase, or crowd the animals. As a potential client – you have enormous power to show that you are aware of this fact, and that you will expect your operator to be aware of it as well. 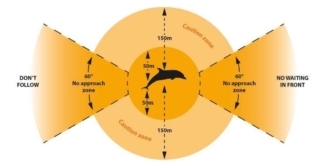 An approach diagram taken from the 2017 Australian National Guidelines for Whale and Dolphin Watching clearly demonstrates how whale watching vessels can minimize the disturbance they cause to the animals that are being watched. Do you have suitable safety measures in place? Operators should be able to assure you that they have an experienced and licensed boat handler and crew, and that the vessel is properly registered, licensed and inspected (according to the norms of the country in question) – not only to navigate, but to take tourists. The operator should provide life-jackets for all the guests on board, and the tour should always begin with a full safety briefing for passengers. Do you have a naturalist or guide on board? On very small vessels, the skipper may act as the guide, while on larger tours, a naturalist may give running commentary and information over a loudspeaker system. However the information is provided, you should be able to learn about the animals you are seeing and the environment in which they live. A tour with a good guide can offer you an educational and enjoyable experience even if you don’t find whales or dolphins (and it is important to remember that this is always a risk when you are viewing free-ranging wildlife). He or she should be able to identify the species of marine wildlife you are seeing (including birds and fish as well as the whales and dolphins) and tell you some interesting facts about the local marine and coastal environment. He or she should be able to tell you about the behaviour of the animals you are seeing, as well as give you some insight into the conservation issues they face. Do you contribute to research or conservation in any way? There are many ways that a tour operator can contribute to the understanding and conservation of the whales and dolphins that they watch. A responsible tour operator is likely to collaborate with a local research group, and either collect and contribute data themselves or host researchers on their vessel. Data collected from whale-watching vessels can include, logging their daily tracks and sightings to more accurately understand (seasonal) whale or dolphin distribution and providing photos for use in long-term photo-identification studies. In some areas such as the Gulf of Maine off the Northeast coast of the USA, data contributed by whale-watch activities has played a very important role in the long-term understanding of a population. An operator may also partner with a local conservation NGO, or even organise their own activities in the community to promote environmental education or conservation. These questions can also be remembered with the handy acronym: SCORE (Safety, Conservation, On board education, Regulations, Environment and community), and are summarized in a downloadable PDF checklist here. While asking these questions may add a little time to your efforts to put together the perfect holiday itinerary – it is likely to result in a much more rewarding experience for you, and will reward those tour operators who are doing their best to protect the populations of whales and dolphins upon which their industry relies. Operators should provide life jackets for all passengers on board and give a clear safety briefing before departure. Naturalist guides in St Vincent and the Grenadines use posters to educate passengers about the species they are likely to see. Photo courtesy of Fundacion Cethus. 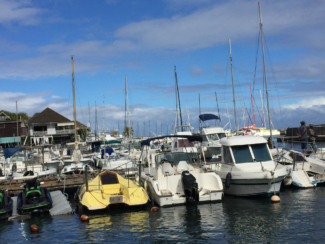 Harbour in Reunion, Photo courtesy of Gianna Minton.